Born in Germany, King of East Anglia at age 14, crowned on Christmas Day 855, Edmund was a model ruler, concerned with justice for his people and his own spirituality; he spent a year at Hunstanton learning the Psalter by heart. Following one of a series of armed engagement with invading Danes, he was captured. 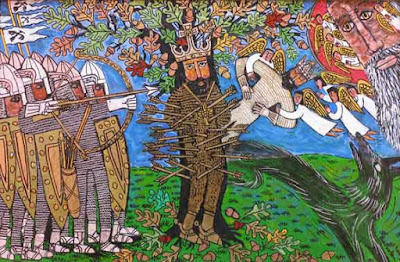 He was ordered to give his Christian people to the pagan invaders; he refused and was beaten, whipped, shot with arrows “until he bristled with them like a hedgehog”, and beheaded at Hoxne, Suffolk, in 870.